The theme to this week’s Top 8 was Year They Were Born. Who could ever forget Mad World? We remember and so does the world. It was Simon Cowell’s first time on his feet and taught America to set their DVRs to run 5 minutes overtime from now on! Were you part of the Idol Forum/Adam Lambert group? 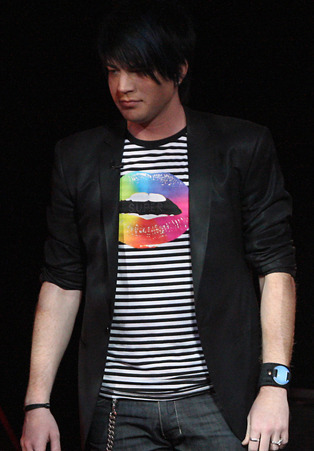 If so, you may remember many fans decided that the multi-colored striped shirt Adam was wearing for this routine would become their Fan shirt for the American Idol Tour. In a way, Lila’s and my dedication to this website started with that shirt. We didn’t meet until the homecoming at the radio station and high school on May 8, 2009. A few days later we got together for the first time to work on the Finale Watch Party for San Diego. We discovered we both wanted the shirt and learned they had come in that day at JoyRich, up in Hollywood. Acting on our shared spontaneous nature, we decided to jump in the car and drive 150 miles north to pick them up. I still get a secret thrill every time I wear my shirt! That day’s journey was epic in itself, and written about on the website. The rest is history! Not trying to read into this, but take a look at who’s dancing at the judges’ table at the end. A little foreshadowing?! Even though Idol was forcing commercials into their programming, this was one of the best. Something had to pay for the cars given to Adam and Kris at the finale! Did you know about these intimate videos with the contestants? They were a subscription from iTunes, and only available for video iPods. I’ve only found a few and since Top 8 was one of them, it’s included here. As a bonus, I’m starting with the Top 13, which was the oldest one located before Top 8. These videos are second and third generation so not the best quality, but the substance is gold! Scott Mac Intyre was voted out this week. See you next week for Songs From the Cinema! Love going down memory lane with you. I followed Adam from Day 1, when he had less than 500 ppl following him on twitter, so yes, my “Glambert” number is way low. What a ride it was, to be part of the original excitement. No words do it justice. This is so great Carol. I remember all of this. Wish I was in San Diego with you folks. My life changed forever. I will be seeing Queen in Chicago in July, but hope to get to a few more shows somehow. I overpaid for my excellent seat but I can’t wait. Does anyone know where to get that professional DVD that was supposed to have been made by Queen for their Japan concert? I have no idea where to buy it. I didn’t love Mad World nearly as much as some of his other performances like Black and White, A Change is Gonna Come, Tracks of My Tears, but it was good. Mad World was the first time I ever laid eyes on him. 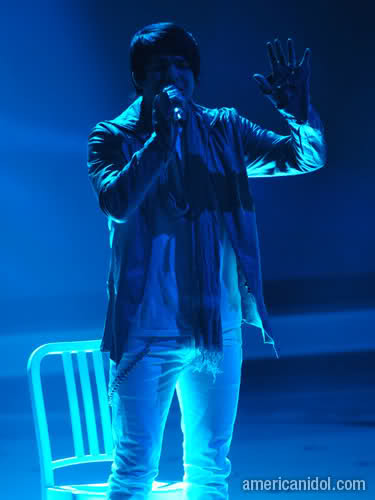 My DVR was set to record Fringe, and at 9:00 it changed channels and it was Adam sitting on that chair. My exact words were “What is this sh*t”. My next words were “Oh my God”. I had no idea it was American Idol, I had never seen American Idol. Thank God for Fringe, that’s all I can say. Thank you so much for putting these together, I’m waiting for a stretch of free time to watch all of it. Seems so long ago, and yet like yesterday.